Unleash your power and explore your inner hero with DC Super Hero actiondolls! Inspired by the powerful students of DC Super Hero High, the DC SuperHero Girls action dolls are ready for powerful fun. In 12-inch scale, theWonder Woman action doll is positively Amazonian! She wears a fabulous outfitthat blends the iconic elements of her original DC Super Hero character --red, white and blue; stars on her pants; and signature armor -- with moderntrends ready for action fashion. Accessories are equally awesome! The naturalleader and top athlete sports her Lasso of Truth, Super Hero wrist cuffs andtiara. 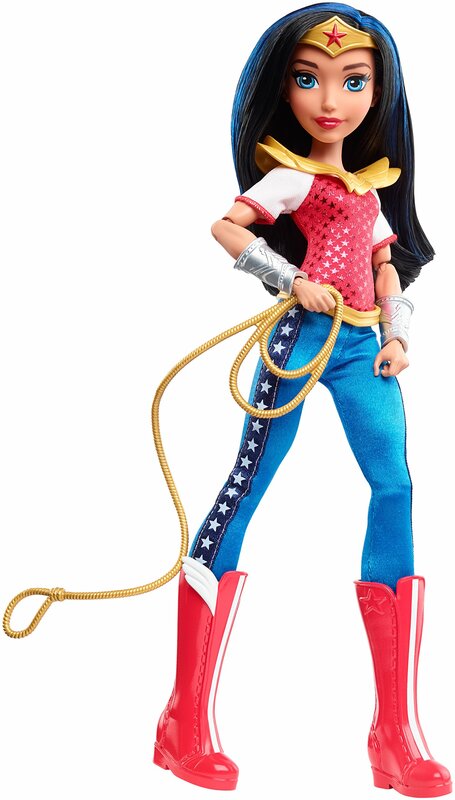 Designed with high articulation and the ability to stand alone, theWonder Woman action doll is ready for powerful posing and creativestorytelling -- capture a moment of action with ease. Girls will love findingtheir own unique abilities along with the preeminent students of DC Super HeroHigh who learn to master their powers and the hero fundamentals in ways bigand small. From a routine school day to a Super Hero adventure, the galaxy isthe limit! Collect them all for a full attendance (each sold separately,subject to availability). Includes Wonder Woman action doll wearing fashionand accessories, including wrist cuffs, tiara and Lasso of Truth. Colors anddecorations may vary.